Margin Call does a marvelous job of finding a crucial moment of revelation in the now global financial recession and creating a world of characters, conflict and decision making around this moment. If the unnamed financial firm in this film were Lehman Brothers the film depicts the precise moment at which they knew the world was going to collapse on their heads. Our entry point into this world is with two low-level, but still brilliant, risk analysts at the firm, Peter Sullivan and Seth Bregman (Quinto and Badgely), who, in the opening, witness the firing of their mentor, Eric Dale, played by Stanley Tucci. Like severing an umbilical cord, Eric is cut off from the company, and most importantly he is unable to finish a key project. Peter takes over Eric’s work and connects the dots, which reveals the enormous crisis that is about to explode. For the most part, the financial crisis in this movie occurs in one night, in the empty corporate elevators, boardrooms, cubicles and hallways of their building. The crisis management team is called in, including the head honcho, John Tuld (Jeremy Irons), who impressively flies in via helicopter and lands on the roof of the building. JC Chandor’s writing feels like David Mamet or Neil La Bute featuring type-A men operating on their own company like surgeons. The film works best in this clinical approach, the high point of which occurs in the first boardroom debrief for Tuld when Peter, who identified the gaping hole in the balance sheet, distills the crisis in one magnificent dialogue exchange. It takes a third of the movie before this scene arrives, and before that we don’t know what’s wrong with the numbers. Hiding the gory details seemed like a conscious effort to portray the crisis as a nebulous, incomprehensible jumble of numbers. But thankfully Chandor doesn't placate his audience and saves this reveal for the boardroom scene. 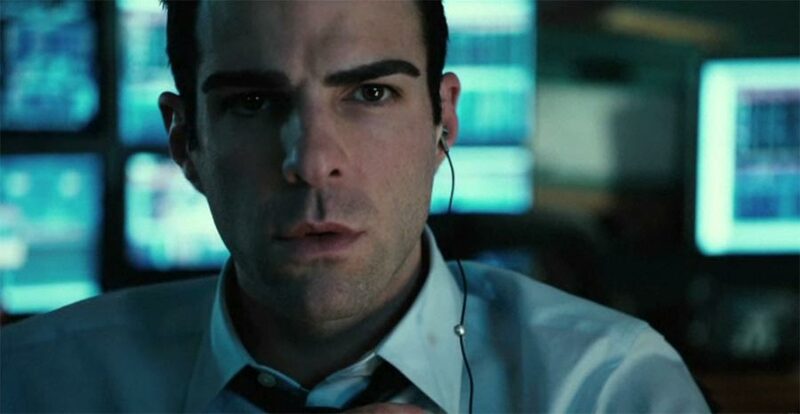 And although Zachary Quinto’s explanation is financial and mathematical gobbledygook, it seemed accurate and believable based on my rudimentary knowledge of finance. Comparisons to Wall Street have been made, and indeed they’re not unfounded. The ‘greed is good’ speech from Michael Douglas is almost matched by Jeremy Irons’ breakdown of their situation when he profoundly reminds everyone of his career mantra: "There are three ways to make a living in this business: be first, be smarter or cheat." Irons chooses to be first by liquidating their assets as quickly as possible to reduce their exposure to the eventual meltdown. The burden of this ethically challenged decision lies with Kevin Spacey, who only in the second half assumes the heart and soul of the film. The decision to comply with his boss’s demands and divert the financial damage from themselves to his clients becomes the film’s core decision. Chandor’s approach is laudable, but he occasionally misses his execution. This film works best in its most clinical aspects, like All the President’s Men, which purposefully eschewed character development for the chase of the Watergate story. Chandor attempts to infuse an emotional story for the film’s characters, but it never matches the big world stakes at play. Demi Moore’s character, for instance, is made to be the scapegoat, which causes her much distress. But how can we sympathize for millionaires who lose their jobs? There are a number of these false starts, chiefly with Zachary Quinto’s character, Peter, who is presented as the moral centre of the film, but he is unceremoniously pushed to the background behind Kevin Spacey and Paul Bettany. Chandor’s ability to create suspense and tension from this microcosm of the financial crisis is in many ways more powerful than an Oliver Stone/Wall Street-like approach, which is what Wall Street: Money Never Sleeps attempted to do. The inhumane scuttling of their own ship is both morally careless and cowardly, which, despite the character deficiencies, is heard loud and clear by the end of the film.